Winter is a fun time in gardening. Seed catalogues cascade through the letter-box, new varieties of vegetables beg us to order them, and, best of all, you can spend ages staring out of the window with a clear conscience as you plan for next year. Now, do you have a herb garden? 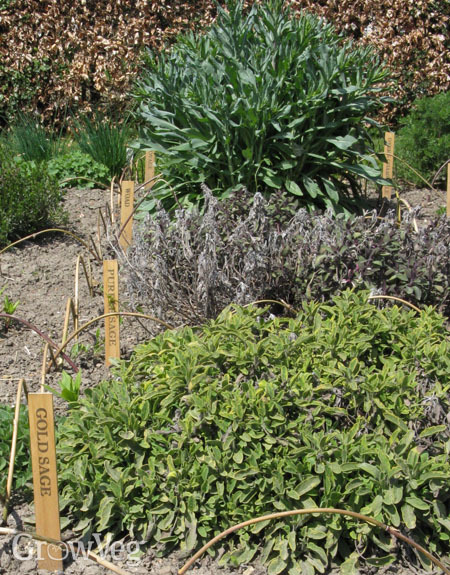 Most of us have herbs dotted around our beds but there’s something delightful in having them massed in one area, putting all your flavourings together. So many herbs enjoy the same conditions that they make natural companions. Accepted wisdom dictates that herbs should be grown as near to the kitchen door as possible. Cooks, it is felt, are unwilling to stray too far to pick parsley. I suppose if you own an estate the size of a small county, this could be true, but personally, there’s nothing I enjoy more than an excuse for a trip down the garden in the middle of a busy day. True, in winter, in the rain, the trip is less appealing. This is why, wherever you place them, herbs should be easily accessible. At its simplest, this could mean placing them along the edge of a path. A good position for the herbs is far more important than a good position for you, and their first requirement is sunshine. You can get away with a bit of shade during the day (perennial herbs such as rosemary and thyme will pass the winter in shade without harm), but most herbs appreciate as much sun as they can get (mint and chervil are exceptions which do better when partially shaded). Shelter is also appreciated – in the UK that usually means away from northern or easterly winds (this could be an excuse to create a sheltered spot with espaliered fruit trees or trellis), and a south-facing slope in full sun is worth serious consideration; large perennials can be placed at the back, while tenderer annuals sit protected at the bottom of the slope, where the soil will be moister. Most herbs hate getting their feet wet for any length of time so soil should be free-draining. Sandy soil is fine but clay soil will need compost and grit added liberally to loosen it up. Bearing in mind where they come from, Mediterranean perennials such as rosemary and lavender thrive in poor, impoverished soil, but annuals tend to be a bit different. Basil, coriander and dill, for example, all enjoy good, moisture-retentive soil. It’s these differences that make the traditional monastery gardens so sensible: generally dividing herbs into beds, arranged symmetrically around a central point. Emulating this, the simplest design would be four beds, each a square yard (or square metre) in size, around a sundial or small round bed containing one tall herb – a rosemary bush or bay tree as a permanent feature, or fennel, which would grow up every year but offer sculptural stems in winter. Horseradish would also make a dramatic summer centrepiece. Group herbs to take advantage of their heights (taller ones near the centre of a bed) and textures. The tall stems and soft leaves of lovage, for example, contrast with the feathery delicacy of sweet cecily, but don’t forget the opportunities for different colour foliage: bronze fennel, purple sage, or lemon thyme with its variegated leaves. The cartwheel has become a popular design, laid down, with herbs planted between the spokes. If you can’t get hold of one, laying out brick "spokes" will give a similar effect. To me this feels a bit fiddly, although I have seen a very effective brick "cartwheel" filled with different thymes in each space. I prefer the idea of a chequerboard in which squares of paving (bricks are particularly warm and attractive) alternate with herbs. This keeps aggressive spreaders more easily contained and makes access easy. 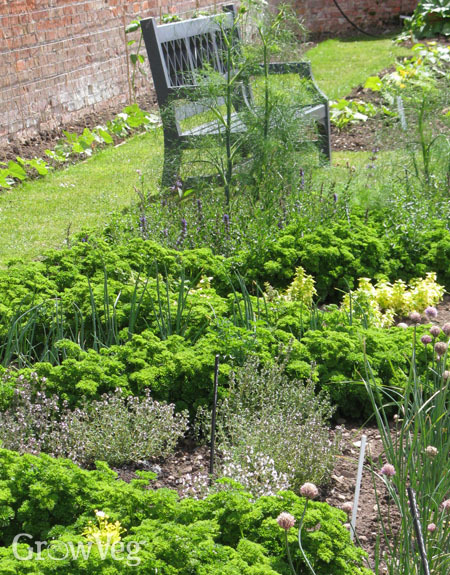 While four square yards is probably enough if you just want to grow the main culinary herbs, herbs make strangely addictive growing, and as you get to know more about the unusual ones, it’s tempting to start planning herb gardens around certain themes. Lists of suggested herbs for various categories, such as medicinal or dyeing, can be found on the Herb Society’s website. In part two of this article I look at practical suggestions for grouping herbs as you plan your garden. By Helen Gazeley. First photo courtesy of Jekka's Herb Farm. "Hi, I like to set up my new herbs garden in the fashion of benedictines monks. Once I saw that they had them in a round shaped area, cutting the circle in 8 equal parts. In the middle of this "wheel" there would be a lemon tree. In each of the 8 parts of the "wheel", there would be a specific herb, thus in all 8 herbs. The "wheel" was 1 meter radius, or a yard. Each herb was put next to the other herb for a specific reason... I had that planned once in my old house, and it was beautiful.. Now I am in a new house, but lost that plan. Do you have it? Do you know what I mean? Please help. May God bless you Silvano"
"Any idea what the tidy pink-flowering plant is that is edging the path in the picture above?"